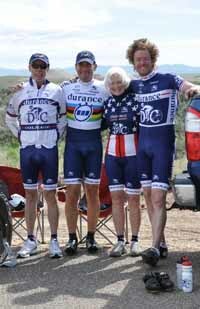 Durance cyclists on the road, from left, John Swyers, Richard Feldman, Patty Puz and Nate Galpin. Based in Ketchum, the Durance/Colnago cycling team traveled to Boise May 12-14 for the Idaho Time Trial Festival sponsored by Bob's Bicycles. The competition consisted of four time trials in three days—a 16-kilometer time trial, a Bogus Basin Rd. hill climb, 20k and 41k time trials, and a final non-aero sprint 8k time trial. Among the participants was Boise's world and Olympic champion, Kristin Armstrong. Ketchum sent current Master's world and national time trial champion Richard Feldman and reigning Master's national time trial champion Patty Puz. When the racing was done, Feldman of Durance-Colnago stood atop the podium as the overall festival winner. Other Durance team members had good results as well—Nate Galpin (2nd Category 4), Patty Puz (3rd Women's Cat. 3/4) and John Swyers (5th Masters C). Swyers turned in a personal best in the hill climb to take third place in his category. On the windy 41k (25.4-mile) course that featured 500 feet of climbing and an uphill finish, Feldman turned in a 54:02 time for first place. Galpin clocked 58:15 winning his category. In the 20k TT, Patty Puz finished third at 40:36, three seconds behind the second-place racer. Feldman, on May 1 in the Emmett Roubaix, won the Master Select class by overall three minutes with a 2.29:09 time. Hailey-based bicycle racer Jackson Long, 17, recently captured the overall title in the 2011 Wenatchee (Wash.) Omnium as a Category 3 racer. The challenging three-stage race included a time trial, criterium and a 64-mile road race. Jackson led his six-racer Hammer/CMG Racing Team to victory with a third-place TT finish, a sixth place in the criterium and fourth in the road race, to take the overall title. Long, the second-place Men's Category 3 finisher in the May Emmett Roubaix at 2.45:55, rejoins his team on May 20 for the 16th annual Mutual of Enumclaw Stage Race.